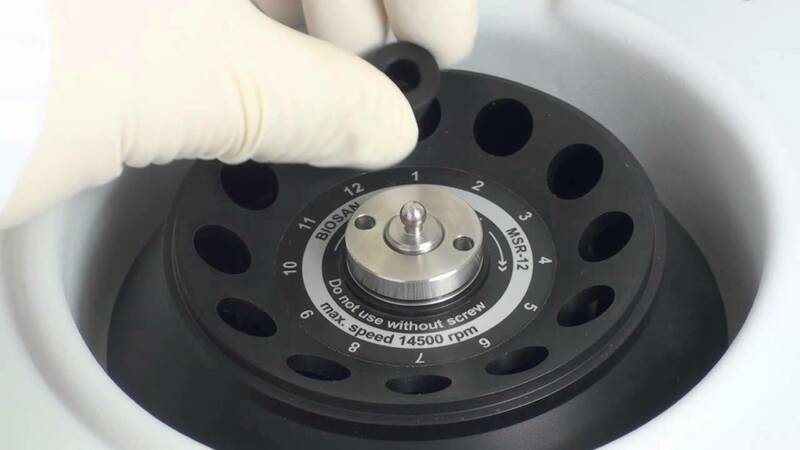 High-speed mini-centrifuge Microspin 12 is a compact desktop centrifuge designed for biomedical laboratories. Microspin 12 is used for extracting RNA/DNA samples, sedimentation of biological components, biochemical and chemical analysis of microsamples. A brushless motor provides noiseless performance at the maximal speed and long service life. An angular rotor is designed for accommodation of 12 Eppendorf microtubes and spin columns. The rotor is made of aluminium, it is equipped with fixing lid and included in the standard specification of the centrifuge. Constant airflow around the rotor reduces risk of samples overheating during operation. Metal protective inserts inside the casing and lid, automatic imbalance switch-off and locking of a lid provide safe operation. Completion of centrifugation is indicated by a sound signal. The external power supply unit allows operation of Microspin 12 in cold rooms (at ambient temperatures from +4°C to +40°C).